My name is Conard Eyre, I am the daughter of David Eyre!! A friend sent me your blog with Daddy's pancake, and I am feeling very wistful, reading all the touching, meaningful and precious remarks. As you can imagine, the pancake had a very special place at our family table, and made my Daddy's creation a household name. I have amazing stories, of how he traded the recipe with Craig, for a week in NYC in Craig's Greenwich Village Apt., how, when early engaged and visiting my husband's stuffy NY friends for Easter weekend in Rumson NJ, the pancake recipe appeared full color and all. I was a long way from home, but that day, I was a Hawaiian princess!! On a very personal note, in 2008, Daddy, at the ripe age of 96, (with all his marbles, but a desire to move on to the heavenly kitchen in the sky,) simply decided to stop eating. We supported him all the way, and prepared his "last supper", naturally, it was the pancake. It got a thumbs-up, and was perfection..
His joy spending time in the kitchen was addictive, and my inherited love of cooking became my profession. I have had my own catering company since 1974. Craig's recipe has taken on a life of it's own in my family, and I would love to connect with you. What keeps cooks faithful to one recipe is often some confluence of ease and surprise. Eyre’s pancake possesses both. 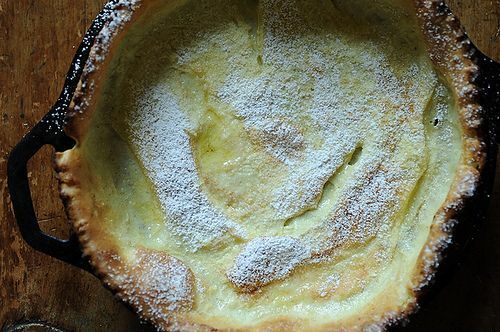 A batter of flour, milk, eggs, and nutmeg is blended together, then poured into a hot skillet filled with butter and baked. Anyone confused? I didn’t think so. The surprise comes at the end, when you open the oven door to find a poufy, toasted, utterly delectable-looking pancake. It soon collapses as you shower it with confectioners’ sugar and lemon juice, slice it up and devour it. It’s sweet and tart, not quite a pancake and not quite a crepe. But lovable all the same. “So many of us eat essentially the same foods, over and over, each day for breakfast. It was for me, a young man in my first apartment, a revelation when Craig Claiborne introduced a Breakfast Pancake on April 10, 1966. I still have the page out of the magazine I tore out and saved. I have prepared his recipe at least 500 times since, first in a cast iron skillet and in recent years in a paella pan. Being impatient, 20 minutes was too long to wait for it to bake, so I have inched up the temperature over the years and enjoy a pancake that creeps up over the edge of the pan and browns along the edges in less than 10 minutes of baking. His original recipe calls for sprinkling lemon juice and powdered sugar on the baked pancake but up here in the north woods, maple syrup is the finishing touch. Sometimes I sauté thin apple slices sprinkled with a bit of sugar before pouring the batter in the pan for a variation on the original recipe.” - Roland Krause, Harbor Springs, MI, letter. “Surely a golden thread through my life… My memory is of jumping up and making it then and there. Once I passed through Honolulu and phoned David Eyre, the address blazed from the directory: no. 1 Diamond Head Drive. When I thanked him for all the lovely Sunday mornings he remarked that I wasn’t the first to call, either. Later, I moved to Indonesia where Sundays were so different from L.A.; without even noticing I forgot both pancake and recipe. Years later, a friend sent me a copy of a cooking magazine with recipes from readers. A woman from the Midwest sent an “oven pancake” which she said had a man’s name but she never learned it. There it was and I felt that golden thread connecting my two lives, then (L.A.) and now (Jakarta).” - Loura White, letter. Don’t overmix the batter, or the pancake will be tough – a few lumps are fine. This is the moment to call your well-seasoned iron skillet into service. 1. Heat oven to 425 degrees. Combine the flour, milk, eggs, and nutmeg in a bowl. Beat lightly. Leave the batter a little lumpy. 2. Melt the butter in a 12-inch skillet with a heatproof handle. When it is very hot, pour in the batter. Bake for 15 to 20 minutes, until the pancake is golden brown. 3. Sprinkle with the sugar and return briefly to the oven. Sprinkle with lemon juice, and serve with jelly, jam, or marmalade. Footnote: April 10, 1966: “Pancake Nonpareil” by Craig Claiborne. Recipe adapted from David Eyre. This is actually the classic Finnish Kropsua or Pannukakku and Finns have been making it for a thousand years and more. Don't use the recipes that call for equal milk and flour, increase the milk. Does it really rise up the sides of the pan like this? I made it last night and it was delicious and bubbly, but it stayed at the bottom of the pan and was quite thick. Do you swirl the batter around before baking it? All in all very easy and quick, super enjoyable and versatile recipe, thank you! It does! I'm mystified because I've never had a problem with it not rising up the sides of the pan. Was your oven fully heated before putting in the pan? That's the only reason I can think of that it wouldn't rise up the sides. Last week my daughter called me for the recipe for what we lovingly called "The Big Fat Pancake" in our house. I remember the day when my mother and I found the recipe in the New York Times. We tried it right away and were hooked. Through some errors, I learned that if you want to double the recipe, bake it in 2 pans (I use cast iron skillets.) We love it with lemon and confectioner's sugar--nothing else. And, each one doesn't serve more than 2 people. I guess we're big eaters. Hi Pauline, thanks for stopping by -- hope to see you here more often! I made this often for our family. My husband and I were not married until 1967 so I don't think we saw the original post but my recollection is that sometime in the 70's (perhaps when cc was retiring)?) it was reprised as a most requested recipe. We called it puff pancake in our family to distinguish it from "flat pancakes". Glad you rediscovered it here! I have had this recipe in one of my hand written cook books and never tried it for some reason..Now I have a reason. Thank you for posting a classic. You're welcome -- hope you'll give it a try. It's a great recipe! I love this - the story, the letter, the history and the recipe itself. It's right up my alley and I can't wait to try it out! My mom made these when we were growing up in the 70s. She called them Bismarcks. So delicious. Just made the Eyre recipe this morning, and even though I used half the butter called for in the pan, it was delicious! Conard Eyre's note is beautiful to read. It's so nice she let you share it with us. @reatta - If you look under the first picture for the slideshow, there is an orange "share" symbol and next to that is a printer icon. If you click on that, it gives you a print-ready version of the recipe without all the photos. This is one recipe that I haven't tweaked. I'm too afraid that if I change it, it will be for the worse. How cool is the Internet! What would Craig Claiborne/Pierre Franey have done with it? Aw, what a sweet letter. And as I've mentioned before, this recipe has become my family's fav weekend bfast...so easy and tasty. We all love it. Didn't realize it would print the entire slideshow -- sorry about that. I've forwarded this to our tech team to look into. Thanks for letting me know! See my reply regarding your printer issue above. Happy New Year! How cool to get a note from David Eyer's daughter! I hope you scrapebook all the notes from recipe originators to keep with your copy of the Cookbook for posterity sake. What an historic addendum it would make. I only made a similar recipe in the past year and fell in love with it. I love it as a dessert; quick to make, not too sweet and with a lot of possibilities for garnishing it. I must give this version a try. Thanks for the update to the original posting of this recipe. This is so, so wonderful. Thank you for sharing this with us, Amanda - you must have just been bursting when you received this note! Good heavens! This was a family classic for us as well, but I hadn't had it in years until last week. I didn't trust my popover pans not to stick, so I thought I'd go back to this old favorite. We sometimes had it with the powdered sugar, sometimes with the apples that others seem to like. But usually, we ate it with lingonberries, and that's what we did last week. I'm off to search and see if I can find an original clipping. Hello all, and happy New Year! Please check out the updated blog post, with a letter from David Eyre's daughter, Conard! Dear Amanda, HOW sweet! Thank you so much for sharing this! That was very special! Thanks for sharing it with us, Amanda. This looks like a great campfire treat!